Anita & Kiara that are Anita Dark (anita khaos) and Kiara Dark (kiaraslet) and Sweet Paradise is their home, their paradise. It consists of 2 islands, on each of them is nice house with several porches and piers. Kiara’s sailing yacht is anchored between the two islands. Both houses are furnished and decorated with great love for the detail. At the beach and on the porches are many spots to sit and talk and cuddle. Birds are flying and on the smaller island is a little group of flamingos. Yes, it’s a paradise, a place to take a time out. I was surprised that Sweet Paradise to the Dark’s is open for the public as it looks being a private retreat, but as mentioned above I felt invited to visit and I appreciated the invitation. Sweet Paradise to the Dark’s offeres a lot of nice and peaceful views and is for sure a place for taking pictures. 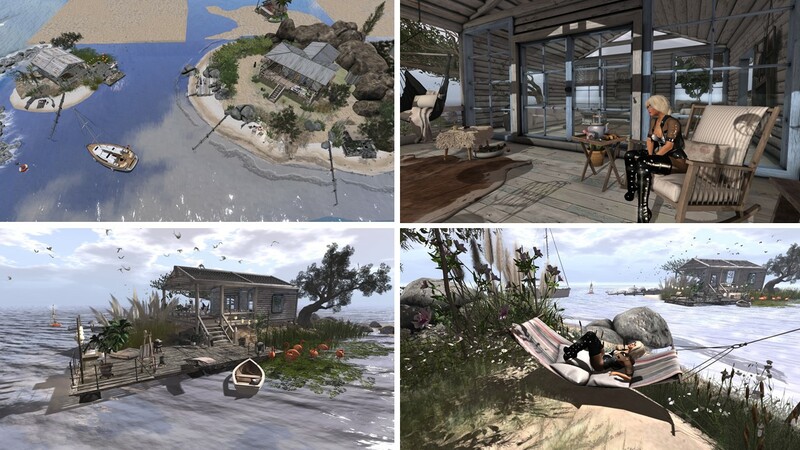 It is another example of what is possible in Second Life with just little ressources. I enjoyed a very relaxing time there. Thank you, Anita and Kiara.